Here are three really quick pages I made using papers from the Bazzill Paper Pack Spooky & Kooky. This is our final project for October. We will be back on Tuesday to start a month long celebration of Christmas. The Design Team have been really busy creating some fantastic Christmas projects. I'm sure you will enjoy what we have to share with you next month. Here is another cute Halloween layout. "In this layout I have used a mask of a tree and spritzed it with bleach to create the haunting back ground." Today we have a fun Halloween layout to share with you. Today's project is an A4 layout from Teresa. Today's project is a simple all occasion card. 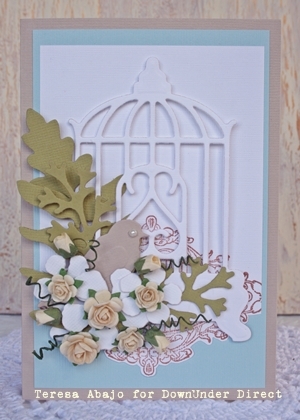 Here is another pretty card using the Spellbinder die Bird Sanctuary. 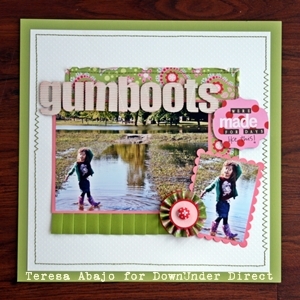 Here is a cute layout from Sheree. Today I have a classic black and white card to share with you. Today's tutorial is a technique that has been around for some time. I've been using this one for years with rubber stamps. I think that it is always good to bring back old techniques as they can sometimes be pushed aside and forgotten. 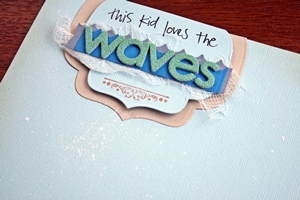 Today rather than using rubber stamps I have used Impressabilities to create a textured background. 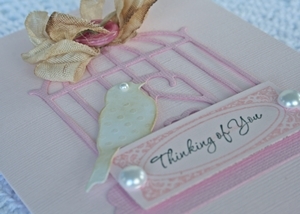 Cut desired shape using your Spellbinder dies. Place an Impressabilities on the base plate of your cutting machine. Place the cut out shape on this. Cover with the mat and top plate and run through your cutting machine. You now have the embossed shape. Very gently run the versamark pad over the shape. Only apply slight pressure as you want the ink on the raised parts only. Using a soft paint brush, cover the shape completely with Pearl-ex powder Once again a soft touch is needed as you don't want to grind the powder into the paper. Once the hape has been covered with the powder, rub over the entire shape with a tissue. This will remove the powder from everywhere except the raised areas. Spray with a fixative if desired. Spellbinders are fantastic for decoration of home décor, on special occasions like Halloween and Christmas. Check out these spooky lanterns from Sue. Today's project is a cute layout. 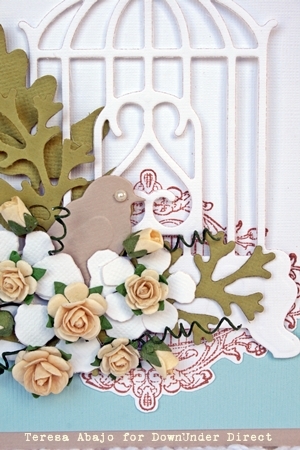 Today's project is a pretty all occasion card. Using glimmer mists and lots of leaves from the garden you can make your own patterned paper. 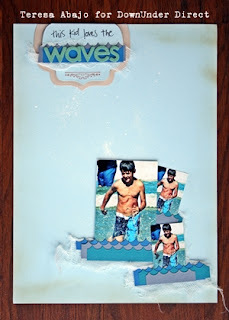 This layout shows how you can achieve the same busy and patterned look of other designers by layering lots of coloured card and making your own papers. 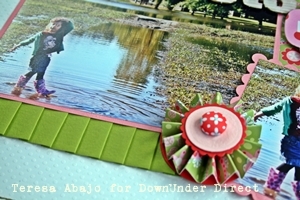 You can use just the edges of the pennants to create a lovely edge for your photo. Today I have a layout to share. The new Spellbinder die Orchard Harvest Tags & Accents is perfect for Autumn themed projects. Here is a pretty card made by Teresa using the Spellbinder Die-Bird Sanctuary. Today we have another halloween card to share with you. Here is a clever idea to store your bits of Bazzill for future reference. 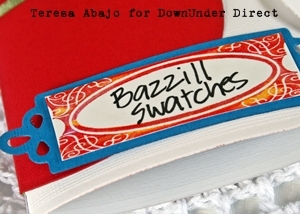 "I made this little swatch book with lots of pockets to put scraps of my favourite Bazzill colours. I have scribbled the names of the colours on the scraps themselves. 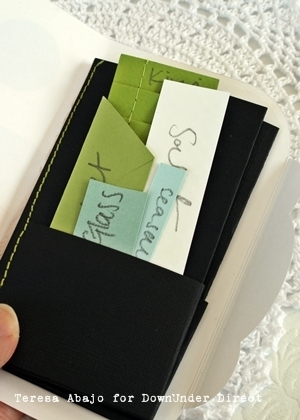 This little book is small enough to fit into my handbag when I go shopping." The grand caliber large dies are great for making unique shaped cards. Here are a pair of boxes made using the new Spellbinder Die - Square Petal Top Box. On the one box I've cut out the side decorations and added them to the box, on the other I've embossed them directly into the sides. Today I have a Halloween card that I made to share with you. Although Halloween isn't traditionally celebrated here in Australia, it is starting to gain popularity, and it's now becoming easier to find Halloween themed products for your card making and scrapbooking projects. 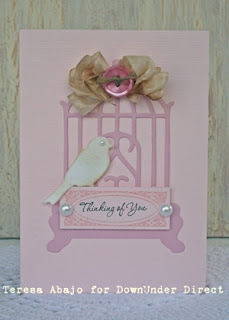 On this card I have used some new products available from JustRite Stamps and Bazzill. Using lots of layers of the Anemone die and red stickles you can make a wonderful flower, great for the top of a box or layout, or a card as Sue has done here. 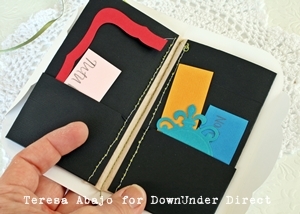 Today's tutorial is for a decorated storage binder to store your Spellbinder Dies. "Storage for me is a big issue and I'm always on the look out for new ways to sort my scrapbooking supplies. When I got the Grand Calibur machine I had to decide on a new way to store my spellbinder Dies especially the grand dies. So I came up with this folder and it was perfect for all my dies." 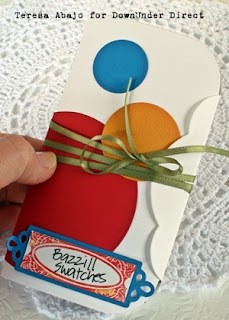 Start with the blank chipboard sheets and cover with bazzill cardstock do this for both sides of the chipboard. Cut your magnet sheet into strips. Place these onto your covered chipboard and lay out your spellbinders so you know that they will fit. Adhere your magnet sheets down with double sided tape. 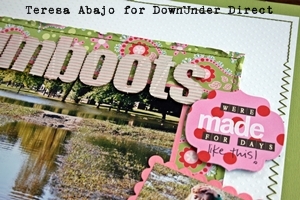 Punch holes into your chipboard sheet and add to your folder. Place your spellbinders onto the magnets to hold them into place. Project created by Design Team member Sheree. Today's project is a set of two mini cards that I made using Labels Twenty-Three as a card base. To make the single fold card just leave the very top part of the die hanging over the fold.